Announcement minutes ago on restaurant Facebook page. How sad! Photo top right, chefs/owners Norm Aitken, Peter Robblee, announced minutes ago Juniper Kitchen and Wine Bar in Westboro is closing after 17 years. The latest in a series of high-profile closings so far this year, it is a tremendous loss in the Ottawa dining scene. NOV 10 14 – 4 PM — This just in, minutes ago: Juniper Kitchen and Wine Bar, with a reputation for consistent quality and creativity for 17 years, served its last meal on Saturday. Juniper in Westboro is the latest in a series of iconic restaurants that have closed so far this year, including ZenKitchen vegan restaurant in Chinatown, Domus Café in the ByWard Market, and Prime 360 after 25 years in business. “We are writing to you today to share some sad news. After more than 17 years of operations, Juniper Kitchen and Wine Bar has closed its doors. “Our last dinner service was Saturday. “This news may come as sudden and unexpected to most of you. It was also emotional and difficult news to share with our staff. And, as owners of the establishment, we are heartbroken to have to close the business. “It’s no secret that running a restaurant is a tough business. It requires a lot of energy, creativity and a sense of adventure. Thankfully, we were able to count on a team of passionate professionals over the course of our 17 years in business who brought those qualities to their work every day. It was their unwavering commitment to create a memorable dining experience that made Juniper a special place. 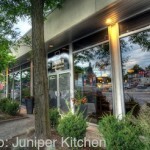 “Juniper is our livelihood and represents a standard for food and service in fine dining in Ottawa. The restaurant was also an engaged member of the community of Westboro, a place we call home. “Through our years of business, Juniper was fortunate to attract a loyal following that ensured our restaurant was always busy. Beyond just being guests, these people became friends who honoured us with their patronage and involved us in the important moments of their lives. “Our suppliers always served us well so we could serve our customers to the highest standard. From the local farmers and producers and the fishing community across the country, we thank you. “All of this made the decision to close especially difficult. “Today’s announcement is driven solely by economics. The realities of running an independent fine dining restaurant are more challenging today than ever before. This is especially the case in neighborhoods like Westboro where real estate costs have risen dramatically in recent years. No matter how we looked at it, it was simply no longer viable for us to keep operating at the same standard of quality and remain profitable. “Right now our priority is our staff. We are working through our personal networks in the industry to ensure they will all find a home at one of the many excellent restaurants in Ottawa. We know their experience at Juniper will stand them in good stead. Together, they form one of the finest teams. “So, today is the end of an era for us personally and for many of our co-workers, loyal clients and many friends. “But every end also marks a new beginning too. And each of us hopes that our future includes the same kind of magic we were fortunate enough to experience over the past 17 years. “We know many of you will be disappointed by today’s news. Still, we hope that you’ll also remember the many happy moments and memorable meals you shared at the restaurant over the years. “The Juniper Facebook page (https://www.facebook.com/pages/Juniper-Kitchen-Wine-Bar/99686805428) will remain active for the next two weeks. We encourage you to share your own personal stories. Your testimonials will help us remember the good and joyful times.